The Challenger Services CP66 hydraulic pipelayer is available with a Cat® D6D LGP or D6D tractor. The Caterpillar D6D tractors operate smoothly with precision load control. The oval track gives the operator complete stability in all terrain. It is easy to operate with a minimum amount of training or experience. This pipelayer has infinitely variable speeds with an optional free fall on the load line. There is also an optional two speed on the load line or boom line. All hydraulics used to operate the pipelayer are plumbed through the original tractor hydraulics. This feature alone induces cost efficiency due to less maintenance, thus enhancing the operational safety of the pipelayer. This pipelayer has less ground pressure than the 561M and 50% more capacity. 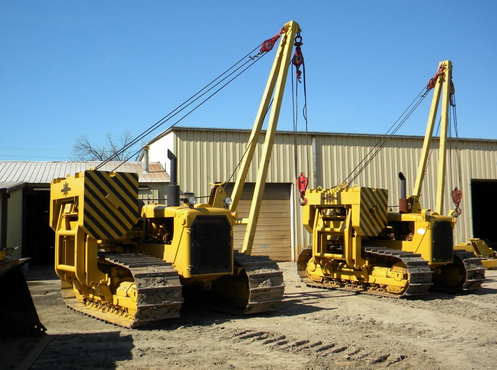 Lifting Capacity on the D6D LGP is 70,000 lbs and on the D6D 50,000 lbs.